All HDDs have been removed. 32 GB of RAM. No cables or power leads are included. See photos for condition and connectivity. 6 caddies are included. Dell PowerEdge T110 II. CPU: Xeon E3-1220. Hard Drive: None, but 4 caddies included. 1 x DELL Gigabit Server NIC Adapters onboard. Windows server 2011 Standard Genuine key. Server OS will need to be re-installed. HDDs have been removed. Includes front fascia, three caddies (plus one blanking). No power lead or cables included - main unit only. 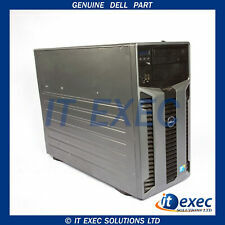 Available for sale is a Dell Poweredge T620 Rackmount Server (2x Xeon E5-2640 Hex (6) Core / 64GB / No HDD) 6464. This item is tested and working, and has been reset to factory defaults. It originally had an SD card (Dell PN: 738M1) fitted, but this has been removed, and is not included. Condition is Used. Collection in person only. No sound card. 2 hard drives 500gb. Model: T7500. Type: Server. Manufacturer: Dell. Part No: BD45V4J. Speed: 2.4GHz. System type: 64 bit. -Hard Drive: 250GB SATA. -2 Network card and Ethernet Port. 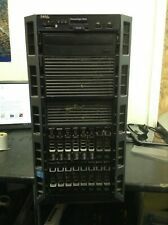 Dell T110 Server. Condition is Used. Collection in person only. 2x 500GB Sata hard Drives. Added extra HDD and RAM. All wiped and clean. 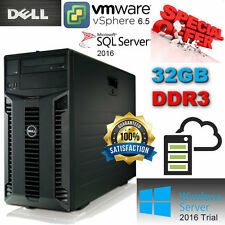 Dell T410 (T410-E111) Server. Condition is Used. Collection in person only. Up to 32 x 2.5” SAS, SATA, Near-Line SAS,SSD drives with optional flex bay. Form Factor: Tower. Microsoft Windows Server 2008 R2. Microsoft Windows Server 2012. Microsoft Windows Server 2012 R2. Microsoft Windows Server 2016. DELL PowerEdge T110 Windows Server 2008. 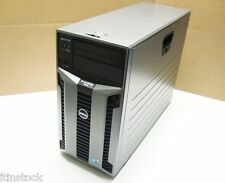 DELL PowerEdge T110 Computer. 2X 500GB (Mirror Raid 500GB visible). Windows Server 2008 R2 Foundation (fresh install). MODEL NUMBER T410. No HDDs or caddies (6 x 3.5" bays). PRODUCT LINE PowerEdge. MANUFACTURER Dell. OPTICAL DRIVE DVD-RW. Rapid IT's highly trained staff each have their designated area of expertise, so should you need advice or assistance you know you'll be getting the best possible help. This server has been power on tested only, to the point where it looks for an HDD and OS to load. 16GB ECC DDR3 RAM. Dell Server Motherboard. Server includes. All hard drives are fully tested by performing a HMG Infosec Level 5 wipe on them. DELL PowerEdge T710, DELL PowerEdge T610. DELL PowerEdge R810, DELL Poweredge R720. This 3.5" SAS Serial SCSI SATA HDD Tray Caddy Special designed forDell PowerEdge R series T series PowerVault MD series, Full compatible with with Dell part number: 0G302D, G302D, 0F238F, 0F238F0, F238F, 0X968D, X968D etc, Good Price and grate value for replacing the Dell F238F SAS Serial SCSI SATA HDD Tray Caddy. 560GB SAS HDD (2x600gb physical disks). I have another server. DELL POWEREDGE T310 SERVER. 8GB DDR3 RAM EEC RAM. NO HD's BUT SUPPLIED WITH 4 CADDIES. Processor Model: Xeon X3430 Quad Core. Condition: Good Condition Throughout Server. Storage: 2x Dell 1TB 7.2k HDD Storage. OS COA: Windows SBS Std 2011 1-4 CPU 5-Cal. Processor Speed: 2.40Ghz. Processor Core Count: 4. 8 x HDD Drive Bay (HDD's Not Included, 4 Caddies, 4 Blanks). This server has been power on tested only. RD1000 Drive (Untested). All hard drives are fully tested by performing a HMG Infosec Level 5 wipe on them. 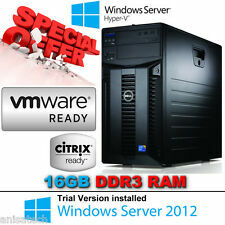 Fully hardware compatible with Hyper V, ESXi, XEN, KVM, VMware etc. DELL PowerEdge T610 Tower Server. Storage: 2x 2TB 7.2K RPM SAS Drive. 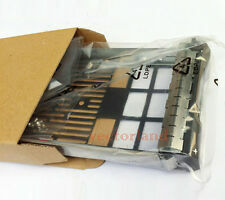 Backplane: 1x 8 Bay 3.5” LFF SATA /SAS /SSD. Tested with VMWARE ESXI. 6.5 /6.7 / Windows server 2012 / 2016 / 2019. Server Options / upgrades . 4GB RAM DDR3 (1333 MHZ). THIS ITEM HAS A SMALL CRASH ON THE FRONT PLATE AS SHOWN IN THE PICTURE. 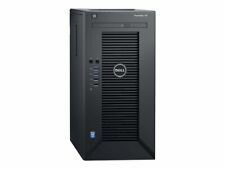 Dell PowerEdge T610 T Server 2xE5603 / 4x4GB / H700i-512MBwB / 2PSU / 8x3.5"
And its easily accessible chassis makes service easy. The PowerEdge 2800 server’s combination of high performance and large storage capacities make it an ideal choice for server and storage consolidation projects. Dell PowerEdge T710 Tower Server Xenon X5550 16GB. Model: Dell PowerEdge T710. RAM: 16GB DDR3 RAM. PERC H710 card. Single 4-core Xeon E5-2407 v2 2.40GHz. 8x 4GB RAM. Model:PowerEdge T410. ComputeUK - Suppliers of new and used Computer and IT related products. Tested, Fully Working. Dell PowerEdge T320 Server. 2x 500GB Enterprise Class Drives as a Mirror Raid Array (2 spare bays still to use). Windows Server SBS2011 STD & Key. 2 x 500GB HDDS in RAID 1. 2 x 1TB HDDs in RAID 1. Xeon Quad 2.4GHz CPU. The server is in excellent condition. There is another working one on the front. This can be replaced if needed.Where available the BIOS has been updated to the latest version also. 16GB DDR3 RAM. 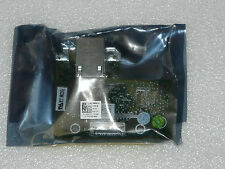 Dell W7H8C Server Motherboard. Server includes. All hard drives are fully tested by performing a HMG Infosec Level 5 wipe on them. Everything is fully tested unless otherwise stated. Fully working Dell PowerEdge T610 Tower Server. 6 spare HDD slots, 2 with free caddies. Heavy and bulky item. Server is in correct working order. All drivers are installed, The display adaptor only has the microsoft basic display driver installed. Notably there is a dent on the top of the server case and a mark/graze on one of the side panels which can be seen in the pictures. Condition is Used. Collection in person only. A serious bargain to be had. Everything you need to know about it below Server Scalability. Dell, Inc. Dell PERC H700. AC 120/230 V (50/60 Hz).